Call of Cthulhu is an upcoming role-playing survival horror video game developed by Cyanide and published by Focus Home Interactive set to release on October 30, 2018 for PlayStation 4, Xbox One and PC. Narrative RPG set in the Lovecraft Universe, developed with Unreal Engine 4. 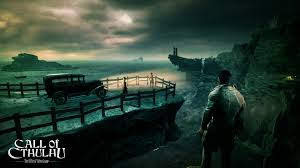 Play as Edward Pierce and shed light on Sarah Hawkins death, while facing the horrors of a grim island filled with monstrosities lurking in the dark. Doubt your own senses and experience true madness, thanks to the game’s unique sanity system. Enhance your character’s abilities and use new skills to discover the truth. Experience rich, open exploration, full of deep dialogue with meaningful choices that impact the narrative and relationships with your companions.